seriousness of life. 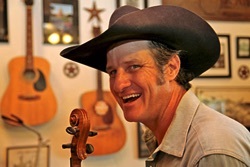 His traditional styling still gathers influence from the western swing of Bob Wills and the easy-going spirit of Jimmy Buffett, mixed with humor the likes of Roger Miller. Originally from the Fort Davis mountains in west Texas, Doug Moreland performs a fresh twist of Texas and Western swing music, with his original songwriting and his dandy band The Flying Armadillos. Being the eldest son of a wainwright, blacksmith, and fiddle-playing ranch hand, Doug set out in 1992 for a career in the music business. After a short stint in Ruidoso NM as a funny man in a dinner show, he then toured with various acts around the country as a fiddle sideman. During this time, he recognized his desire to front his own band and write his own songs, and also discovered the art of chainsaw carving, which all brought him to Austin TX in late 1999. There he progressed from a comedic, solo act with a singing dog as the finale, into a full dancehall band with his wit and charm playing right back into a familiar instrumentation of twin fiddles, upright bass fiddle, swing guitar, mandolin, and minimal drums. Doug received a Will Rogers Cowboy Award for Western Music Male Performer of the Year from the Academy of Western Artists in 2007. He also received an Entertainer of the Year award from the Texas Music Awards in 2007. He played for the Austin City Council at a meeting declared by the Mayor as Doug Moreland Day in 2011. In 2015 and 2016, Doug won a nomination for Western Swing Male of the Year from the Ameripolitan Music Awards.